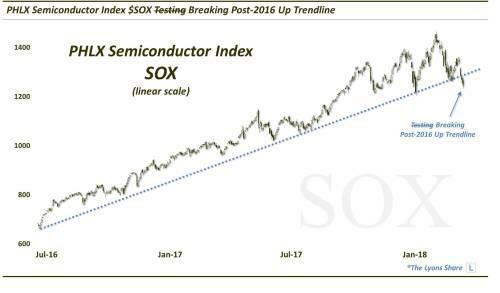 After an apparent breakout to all-time highs just 6 weeks ago, the semiconductor sector is now breaking key uptrend support. In early March, we highlighted one of the sectors demonstrating the strongest recovery efforts following the post-January correction. The sector was the semiconductors, which was not a surprise since the group has been a leader for much of the bull market, especially in recent years. 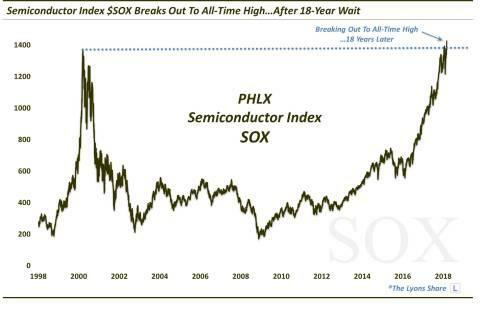 At the time of the March post, the big news was that the benchmark PHLX Semiconductor Index (SOX) had not only recovered its entire correction loss, but it was actually breaking out to new highs. Not only that, but its January highs also lay in the vicinity of its prior all-time highs, set 18 years ago in the 2000 dotcom bubble. Here is the chart highlighted in that post. The breakout, if sustained, portended good things for the “chip” sector. It was not sustained. And that sound you hear are semiconductor investors’ “chips” being sent back across the table because, as they say, from failed moves come fast moves. Indeed, it has not been a pretty course for the chips since as they have fallen hard. So hard, in fact, that if we fast forward to today, we see that the SOX has actually broken down below its post-2016 Up trendline. Needless to say, this is not a welcomed development for the semiconductor group. The break of the trendline undermines the sustainability of the 2-year SOX rally – or at a minimum, slows considerably the pace of advance. But how much of the potential damage is already done – or, how much potential risk do we see here still? And is there any hope for semiconductor investors of the group regaining its leadership role.